When or if to end a relationship is naturally a difficult decision. And it should be. We often invest a lot into our relationships and our partners, and while it may seem simpler to walk out on a painful situation, a part of us often wants to give it another shot. Whether because of the kids, the time we have devoted, or the memories we share, we may feel pulled in different directions in trying to decide what is best for ourselves and how it affects those around us. Detangling the multitude of emotions and defining your priorities in a healthy way takes conscious time and effort. Be fair to yourself and at the least to the happier memories of your partner by properly evaluating your options. Here are some important questions to consider. What happens to your investments? Our investments to our relationships can be materialistic or abstract. We often make concrete investments involving our partners, such as financial investments like real estate, or choosing to raise children together. We also make emotional contributions of support and sometimes suppression for the sake of the relationship. It is important to evaluate the consequences of ending something that is deeply entwined into your life narrative. One of the biggest investments that complicates this decision is children. There is much stigma associated with causing children to grow up in separate households, and much of it is unfounded. Children will suffer less in healthy separated households than in a contentious shared household. A bigger determinant in the value of this factor is your own ability and willingness to take responsibility for this separation. Try to consider your fears and concerns. Talk about it with a trusted friend or with your partner if you are able. What is the motivation to stay? Some of our motivation to stay in an unhappy or unfulfilling relationship comes from our investments. Other times it comes from avoidance of facing our fears of being alone and starting over. By understanding your motivation, you can better evaluate if your desires come from an authentic place or a secondary place of avoidance. The possibility of working through differences and trying to develop a more satisfying relationship does not rest solely on you. If you are wondering if you should end your relationship but want to explore options for bettering it, you need to talk to your partner. Simply pushing away the concerns or minimizing them does not make them go away and actually increases the likelihood that the problems you see will continue and fester into growing resentment. Who can help you make this decision? In some cases, you may feel safe talking with your partner and trust him or her in helping you make the right decision. Other times you may have a trusted confidant who you trust to be objective and help you determine your choices. However it is important to realize that most of the people in your life are biased, especially those who have a direct attachment to your decision, such as an affair partner. Couple or individual therapy is a valuable opportunity to evaluate your options in a safe, neutral space. If you are not ready to disclose your ambivalence to your partner, use individual therapy as a space for you to evaluate your priorities, concerns, and options. Couple therapy can be used to see if the relationship can be saved or as an avenue to safely manage the unraveling of your intertwined lives. 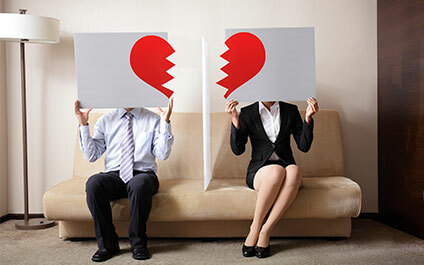 It is not easy to leave a long-term relationship, and it is not a decision to be made lightly. If you are having thoughts of ending your marriage or relationship, call Symmetry Counseling to be matched with a therapist who can help you make authentic decisions and manage any stress or anxiety that comes with shifting the major pieces of your life.